An amazing TV game ! 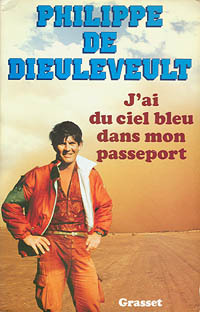 Philippe de Dieuleveult disappeared in tragic circumstances in Zaïre during August 1985. However he remains present in all our memories as "La Chasse aux Trésors" ("Treasure Hunting") TV game program presenter. There is one TV game that has stood out of the others among the numerous such programs that were produced. 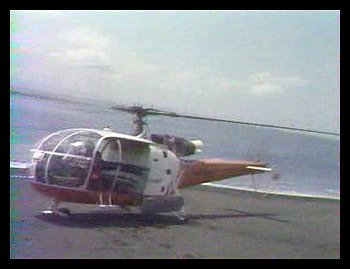 It was the only-one that combined exotism, culture, history, adventure, suspense and ... helicopters. We are speaking of "La Chasse au Trésor" or "Treasure Hunting" that was devised by Jacques Antoine. The principle of the game was very simple : two players in a Paris located studio ordered by radio link a detective-reporter who could be everywhere in the World in order to solve a riddle and find a treasure that was hidden by the producers. This program would certainly not have got the success that it earned without the spontaneity, dynamism and kindness of the detective-reporter, Philippe de Dieuleveult. 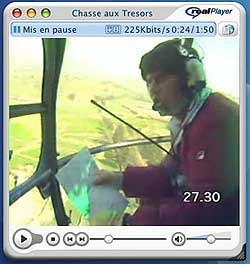 However all attempts to resurrect a similar program later failed (even with the pretty Nathalie Simon on French Channel TF1) with the exception, maybe, of "La Carte aux Trésors" ("The Map to Treasures") presented first by Sylvain Augier, who is by the way a helicopter pilot, and, then, by Marc Bessou. The Treasure Hunting became very soon indissociable of the all red dressed Philippe de Dieuleveult's figure. Philippe de Dieuleveult on board an Alouette III. Photo : Jean-Jacques FAUQUETTE's Collection. 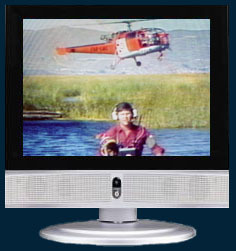 The principle of the Treasure Hunting was simple on the technical matter due to the limitations imposed by the video equipment at the time. The players were in radio link with Philippe de Dieuleveult. An aircraft was used as radio relay and was permanently holding above the hunting location. So, it was a full-duplex direct as for the sound. Radio engineer was often Jean-Paul Le Fur who died tragically in a helicopter crash that also reclaimed the lives of notably Thierry Sabine and Daniel Balavoine during a dark "Paris-Dakar" rally. As for the picture, shooting and recording equipment at that time was not so compact as today's cameras. U-Matic was the current professional video standard during the early eighties and that system required a heavy recorder that was not part of the camera. Video team was then made of a cameraman and an assistant who was in charge to run behind the cameraman and carry the recorder. They were linked together by means of a cable. Pictures were simultaneously recorded in the Paris' studio and on the hunting area. If there were several cameras in the studio, on the hunting field there was just one. The cameraman was then responsible to wholly cover the event in a single shooting scene of more than 55 minutes, which was the duration of the game. Then, definitive mixing could take place in post-production once the videocassette was back in France after the shooting. Pictures taken in the studio were mixed with those taken on the hunting place at this stage. So was the program ready to be broadcasted on the various French language channels. 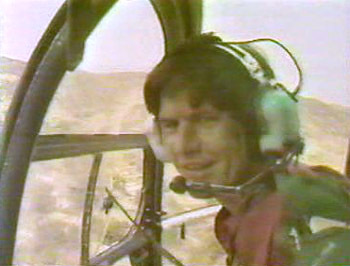 Philippe de Dieuleveult had the opportunity to fly different kind of helicopters during the four years that the Hunting lasted. Some of them were very rare such as this Fairchild-Hiller FH-1100 in Quebec, Canada, or a Mil Mi-8 of the Cuban Revolutionary Forces in Havana. Of course, he also jumped in a lot of Alouettes and Lamas. Broadcast rights of "La Chasse aux Trésors" program are currently held by Adventure Line Productions. (Thanks to Jean-Jacques FAUQUETTE for his friendly cooperation). 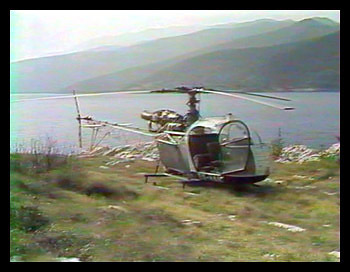 Olympic Aviation's SX-HAH Alouette II Astazou was used for a first Treasure Hunting in Greece. The PK-TPU registered Indonesia Air Transport's Alouette III with a Frenchman at the controls for a very beautiful Hunting in Bali. 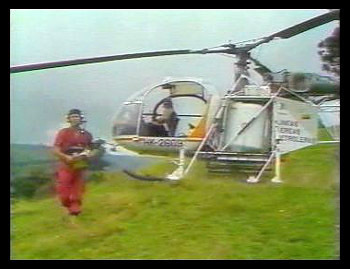 Philippe de Dieuleveult in front of Lineas Aereas Petroleras' HK-2609 Lama during one of the three huntings that took place in Colombia. 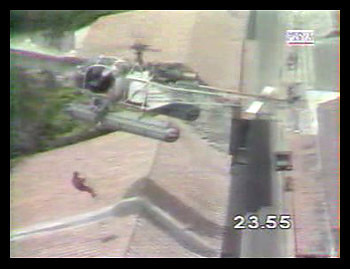 Philippe de Dieuleveult was slinged by a rope that was fastened under the float equipped HK-2609 Lama in order to catch the treasure that was left on a roof in Carthagena, Colombia. Photos : Jean-Jacques FAUQUETTE's Collection.